Seating is limited – RSVP is required and lunch will be provided. Vaki, a Pentair Aquatic Eco-Systems Division, together with FISHBIO and InStream Fisheries Research would like to invite you to attend a free workshop where you can have the opportunity for hands-on experience with our Riverwatcher Fish Counter, one of the most advanced fish data recording systems on the market. There will also be explanations of our Elverwatcher and Smoltwatcher solutions. Additionally, we will cover the latest in water quality monitoring technologies available, from portable meters, to cloud monitoring platforms. This one day workshop will be held at the Executive Suites Hotel in Burnaby, British Columbia, on April 13, 2017 from 10:00 AM to 4:00 PM, and will include a series of informative presentations followed by a visit to Cariboo Dam to see a Riverwatcher in action and hear how it is being used to monitor fish movement. 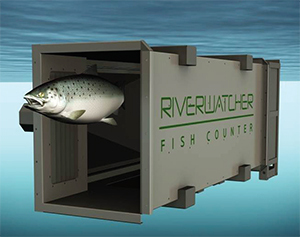 The Riverwatcher is used to monitor fish migration. Used in more than 300 sites all over the world, is installed in fish ladders, pools, traps or similar places where all the fish in the river have to pass. Using infrared scanning technology and high resolution cameras it is possible to recognize different species and validate the counts with silhouette images and photos. • Counts fish with more than 98% accuracy. • Measures the size of each fish with more than 95% accuracy. • Stores an image of every fish for full count verification. • The date and time of day that each fish passes the scanner is recorded. • The water temperature is measured at frequent intervals. • The scanner’s electronic equipment is housed in a strong plastic frame. • Power can be supplied from solar panels and a deep cycle battery. • Easy adjustment for use in fish ladders, dams, traps, and similar places. • Storing and presentation of all data from a PC program. • The Riverwatcher can be used to trigger a video camera. • Multiple scanners can be connected for applications without fishways. Since 1986 VAKI has provided it´s customers with innovative products and delivered high quality and value to its growing customer base. VAKI focuses on fish counting and size estimation. The feature all our products have in common is that they offer the user accurate information to facilitate planning and decision making. They also raise the level of automation and contribute towards increased efficiency in both fish farming and wild fish research. Pentair Aquatic Eco-Systems, Inc. is the largest source of aquatic products and systems worldwide. PAES offers solutions and expertise to improve growing conditions in any environment from recirculating aquaculture systems to improving water conditions in pens. As pioneers in the industry, we provide the best possible solutions for aquaculture facilities, from hatcheries to grow-out and everything in between.